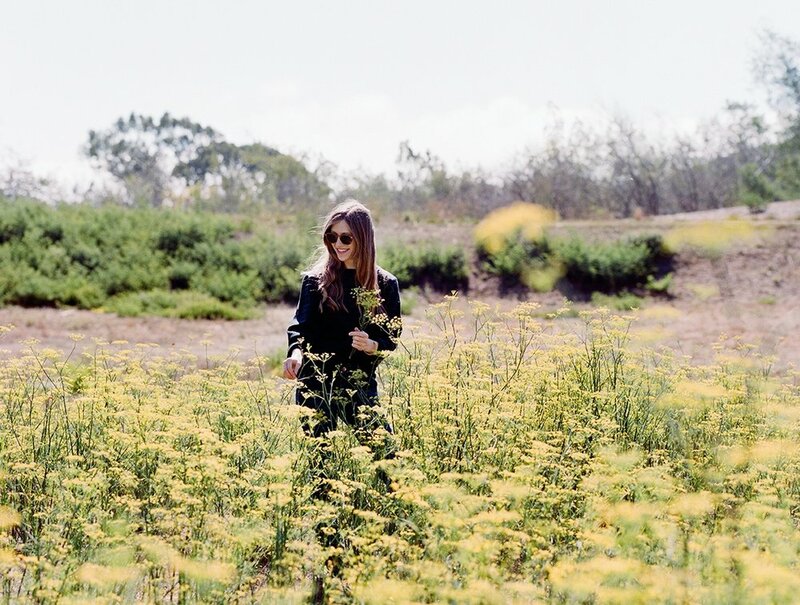 Rowsie Vain was founded by Whitney Smith Morales and is based in the Ojai Valley. Rowsie Vain products are organically sourced and handcrafted using wild ingredients and botanicals, including the use of natural ingredients natively grown within the Ojai Valley. Rowsie Vain is a proud member of the OVLC (Ojai Valley Land Conservancy) group and an active participant in the Wild About Ojai program, which funds the protection and management of Ojai Valley's open space for public use. A percentage of all Rowsie Vain sales are donated to Wild About Ojai. M. Marian features Rowsie Vain's Rosita bath soak, white sage and wildflower smudge, and Baby Moon organic baby oil. Fire On The Mesa is a design workshop based in Joshua Tree. The workshop is run by Anthony and Thao, who have been making furniture together since the moment they met. Previously living on the east coast, Anthony ran a fabrication shop and Thao worked as a textile and product designer. Fire on the Mesa makes furniture and home goods by hand for simple but thoughtful everyday living. M. Marian currently features their tablet board in maple, which is perfect for use as a cutting or serving board. Each board is handmade in the Fire on the Mesa studio in Joshua Tree. Earthen is a collection of functional ceramics and homeware rooted in folk craft and modern design. Founded in 2012 by artist Julia Lemke, Earthen is an independent, woman-owned shop based in San Francisco. Earthen's goal is to create simple, timeless pieces that celebrate the beauty of everyday rituals. M. Marian features Earthen's brass coffee and serving spoons, which are handmade by a local artist in San Francisco. Valerie Confections is named for Valerie Gordon, who runs Valerie Confections with her partner, Stan Weightman Jr. After spending her formative culinary years in San Francisco, in the early days of the farm-to-table movement, Valerie relocated to Los Angeles to run the fabled Les Deux Cafes, one of the most celebrated restaurants in Hollywood history. Entirely self-trained, she left Les Deux and founded her namesake confectionary in 2004 with her partner Stan. Since that time, Valerie Confections has become recognized as one of the top artisan chocolatiers in the country, known for her modern interpretation of classic chocolates and confections. M. Marian features Valerie's popular almond fleur de sel toffee in several of our baskets. Bill's Bees bee farm is located in the foothills of the San Gabriel Mountains. In April of each year, Bill's bees gather nectar and pollen from native wildflowers in the Angeles National Forest. M. Marian features both Bill's bees wildflower honey and their beeswax candles. The honey is 100% pure, raw, unfiltered, and unheated. The candles are pure beeswax and hand-dipped on the farm. Founded in Northern California, Coyuchi is a natural and organic home textile company with the greater good in mind. Mission-driven, the company is committed to creating thoughtfully designed, quality bedding, bath and loungewear that are friendly to both people and planet. Inspired by nature and the raw beauty of the California coastline, Coyuchi designs reflect the simple, relaxed elegance found wherever water meets the land. Minimally processed fibers and responsible production practices are used to ensure everything created reflects the Company’s core ideals: sustainability, organic and natural fibers and a truly human commitment to the hands that touch each product. Nickey Kehoe is a Los Angeles design studio and boutique owned by Todd Nickey and Amy Kehoe. Their boutique showcases their handmade furniture collection as well as vintage pieces and home accessories sourced from around the world. A chance introduction in New York City in 1999 sparked their friendship. Having independently relocated to Los Angeles, the two later reunited to form their namesake design brand in 2004. M. Marian features Nickey Kehoe Collection brass coasters, which are handmade in Los Angeles. Heather Taylor Home is a line of home goods and textiles launched by Heather Taylor in 2013. Inspired by her love of travel and eclectic entertaining style, the HTH collection is designed in Los Angeles and handcrafted by artisans in Chiapas, Mexico. Heather Taylor's handmade pieces – ranging from tea towels and table linens to scarves and baby blankets – have been featured in publications including Vogue, the New York Times, Lucky, and Domino. HTH table linens and tea towels are included in many M. Marian baskets. Dandelion Chocolate is a bean-to-bar chocolate factory based in San Francisco. Founded in 2010 by Todd Masonis and Cameron Ring, Dandelion uses only two ingredients in its chocolate: cocoa beans and organic cane sugar. They roast, crack, sort, winnow, grind, conch, and temper small batches of beans to preserve the characteristics and flavors of each single origin. M. Marian features a rotating selection of Dandelion's 70% chocolate bars. Peter Sheldon mixing glazes from scratch. Photo courtesy of Peter Sheldon. Sheldon Ceramics is a pottery studio run by ceramicist Peter Sheldon. Based in East Los Angeles, and inspired by his rustic Vermont heritage, Sheldon Ceramics features handcrafted and distinctive pieces for everyday use. Many of our baskets include Sheldon Ceramics' Silverlake tumblers. The tumblers are great for wine, spirits, tea, juice - or any beverage, really. M. Marian features the tumblers in a variety of glazes, including classic white, eggshell, and stone. MAAPS is a Los Angeles-based company that launched in December 2015. MAAPS makes its incense by hand using premium quality bamboo sticks, organic essential oils, and natural resin. Each fragrance is created in Los Angeles. We feature a variety of MAAPS incense in our baskets, including Sierra (Sicilian lemon, cedar, earl grey), Heartwood (dark rum, licorice, sandalwood), Savannah (Cochin ginger, lemongrass, eucalyptus radiata), and Rift (smoked rose, sweet fennel, musk). Emily Erb, a specialist in brewed beverages, and Anna Morton, whose background is in herbal studies, co-founded Leaves and Flowers Tea in 2013. Leaves and Flowers sources fresh herbs and flowers from local farms and then sorts, dries, and blends them by hand. M. Marian features Leaves and Flowers' Ajna infusion, a blend of anise hyssop, tulsi and lavender. All ingredients in the Ajna blend are harvested from sustainable farms in Northern California. Semolina Artisanal Pasta is traditional Italian pasta crafted in Los Angeles. Leah Ferrazzani founded Semolina in 2014, after more than a dozen years managing restaurants, including Nancy Silverton’s Pizzeria Mozza, and nearly a decade as a food and wine writer. A self-taught pastaia, Leah’s small batch pastas are certified organic and vegan, made using American-grown Durum Semolina, and they’re incredibly delicious and perfectly textured for discerning home cooks and chefs. Mark Churchill is a ceramicist based in Ojai. Mark has been throwing ceramics for 25 years. Growing up in Ojai, he learned to work with clay from the local artisan community. M. Marian features Mark's beautiful, rustic mugs in our Juniper basket. Kelley Burnett of KB Pottery is a ceramicist based in Los Angeles. Her pieces are primarily wheel thrown with stoneware clays. Burnett's pottery is informed by the years she spent as a floral designer, and much of her work involves creating forms that complement live plants and cut flowers. Burnett intends for her pieces to contribute to daily interactions with nature and as such, her pieces are perfectly suited for our baskets. We feature KB Pottery's double-walled porcelain incense burners as well as her elegant tea bowls. Little Flower is a small cafe and candy kitchen on Colorado Boulevard in Pasadena. Little Flower was Christine Moore's first shop - she now owns three establishments in the Pasadena area. 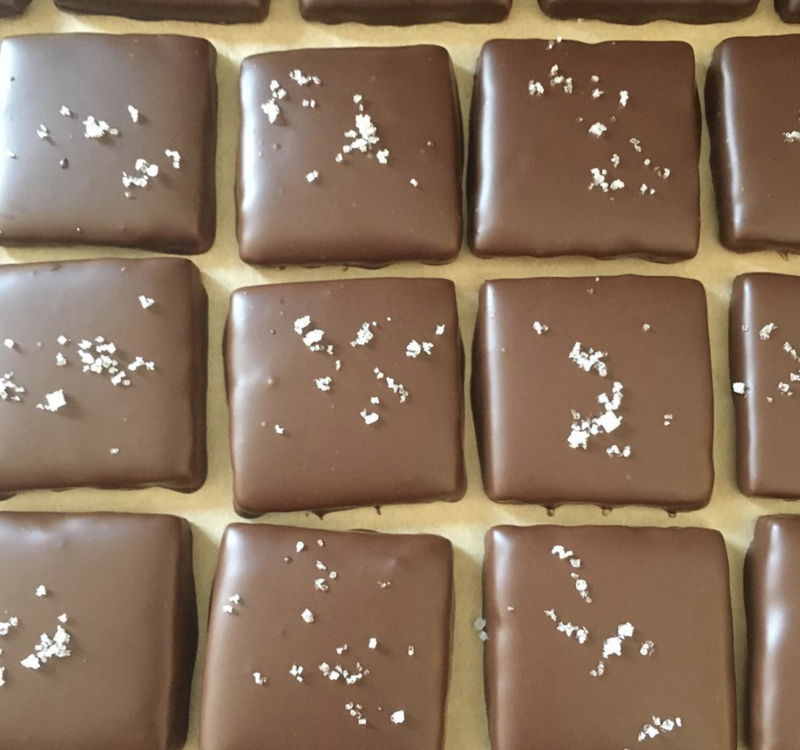 Moore originally gained a loyal following for her handmade sea salt caramels, which were inspired by the caramel-beurre-salé (salted butter caramel) created by the great French chocolatier and caramélier Henri LeRoux. We feature Moore's caramels in many of our baskets. Matteo was founded by Matthew Lenoci in 1996. Today, Matteo employs fifty craftspeople at its workshop and has a collection of over thirty core fabrics. Matteo's manufacturing is and has always been done in Los Angeles. M. Marian baskets feature Matteo's napkins in vintage linen, which has long been Matteo's most popular fabric. P.F. Candle Company was started in 2008 by Kristen Pumphrey. Today, P.F. Candle has a team of 25 who design and produce all of their candles at their Los Angeles factory. M. Marian features P.F. Candle's No. 04 Teakwood and Tobacco candle in several of our baskets. The No. 04 candle, which has a teak and sandalwood base with and a hint of orange and patchouli, has consistently been P.F. Candle's best-seller. Hudson Ranch and Vineyards, located in Napa Valley's Carneros area, is owned by Lee and Cristina Hudson. On their 200 planted acres, Hudson grows ten white grape varietals and seven red grape varietals, along with Tuscan varietal olive trees. Titi’s Extra Virgin Olive Oil, a 2018 Good Food Award winner, is named in memory of Lee’s mother. The olives are handpicked in November and locally pressed in Sonoma. Hudson describes the olive oil as vibrant and green, with strong notes of crushed green herbs and a spicy finish. Rachel Baydian is a ceramicist based in Los Angeles. She creates simple, elegant pieces that can be used in daily life. M. Marian features Rachel Baydian pinch bowls in several of our baskets. The small bowls are perfect for holding your sea salt at the dining table or for using as prep bowls while cooking. They are glazed on the interior, allowing for easy pouring and cleaning. The raw exterior gives the bowls a beautiful, natural look. Shiva Rose is a beauty and skin care company founded by Shiva Rose in Los Angeles. Shiva Rose has gained a loyal following for her non-toxic, all natural skincare line, which she started out of her garage. M. Marian features Shiva Rose's honey and nectar mask and pearl milk cleanser in our baskets for the body. No Tox Life is a Los Angeles-based soap company founded by Sandee Ferman and her daughter, Callie Milford. Sandee makes the soaps, cremes, and hair oils by hand and Callie is the creative director of the company. No Tox Life creates natural, toxin-free, vegan body care with the intention of helping others live a cleaner, greener lifestyle. M. Marian features a variety of No Tox Life soaps and body care products in our baskets, including the Aloe and Coconut Milk bar and the Bamboo and Pumice Exfoliating bar. Jessica Koslow, the founder of Sqirl, started out by selling her jams at the Altadena Farmer's Market. Sqirl jams are made from organically farmed produce and conserved with minimal fair trade organic sugar. We currently feature the following jams: Moro Blood Orange and Vanilla Bean Marmalade, Seascape Strawberry and Rose Geranium, Santa Rosa Plum and Flowering Thyme, and Blueberry Rhubarb.